The microwave furnaces, built by Synotherm Corporation Ltd, will be promoted, according to the companies, “for the benefit of mutual growth and development of the overall microwave industry”. 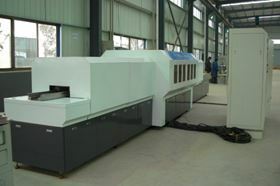 Up till now, continuous microwave furnaces of this type have not been commercially available in Europe and the US, although several are now in use in China and other parts of Asia. The western hemisphere’s first high-temperature (1500°C) AMPS continuous production microwave furnace is operating at the NanoMaterials Innovation Center (NMIC), New York, USA. "As news spreads of the ability of our systems to cut processing time by up to 90% and energy use by 80%, while producing stronger, finer-grained parts, our companies are receiving more inquiries from around the world,” Hines claimed. Speaking exclusively to Metal Powder Report, he discussed the potential of the furnaces. “The technology has been scaled up from lab use, and we’re discovering a raft of new potential applications. In mining, the process makes certain ores easier to crush. The furnaces will also be suitable for high-temperature coating and pigments processing. We now have vacuum furances that will allow sintering of powder metals such as titanium and other materials that require oxygen-free processing atmosphere." Spheric Technologies recently announced it has developed a new production process for a cathode material utilized in lithium ion batteries – lithium ferro phosphate (LFP). The company has filed patent applications covering microwave techniques, material and technology for the synthesis of lithium ion battery materials. “We also have a small furnace sold to dental laboratories that can sinter dental parts in a tenth of the time conventional ovens generally take,” Hines told Metal Powder Report. Thermal processing specialist Harper International, and Ferrite Microwave Technologies have formed a strategic relationship. As 48 ft vacuum furnace has successfully vacuum heat treated nickel alloy components in its inaugural cycle.